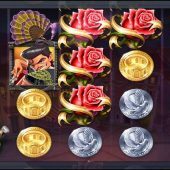 Wild Toro slot instantly creates images of Matadors and bullfighting and of course 'Toro' is Spanish for bull. Set against a backdrop of a village square and various Toreadors we are introduced with the typical maracas and guitar music as the dramatic backdrop for the forthcoming battle. Once again slot developer Elk Studios has explored a Latin theme (Taco Brothers being the other), something they seem to do quite well. So will this Wild Toro have the cojones to live up to its reputation. The reels are over 4 rows and we have a rather unusual 175 ways to win with a 100 coin bet compulsory. The symbols are stacked except for the Wilds and specials and the red roses pay 10x bet for a 5-of-a-kind followed by the oranges and fans at 3x and 2x bet respectively. There are no card values, instead we have bronze, silver and gold coins similar to Yggdrasil's Vikings Go Wild slot which pay 0.5 to 0.8x bet for the 5. A Wild Toro icon symbol appears on the middle 3 reels as a Wild singly as do 3 Matadors which will trigger the games bonus, but first we have quite a fun in-play game. The Wild Toro Bull can appear on reels 5 and is naturally quite angry when he does. He will trigger a series of re-spins and migrate left each re-spin until he vanishes off the reels, similar to the 'wandering Wild' in Netent's Jack And The Beanstalk and as he does so he will attack the Matador if he bumps into him, creating a trail of Wilds. Landing the 3 Toreadors on the centre reels triggers a series of free games without number and limit. At the start Wild Toro the bull will appear on reels 5 and charge at any Toreadors he sees, first vertically and then horizontally and leave a trail of Wilds in his wake. Any wins are paid and this occurs over and over until he has chased all the Toreadors off the reels. This is quite a fun bonus to watch and can be lucrative. Wild Toro slot may have a theme some may not like, but the bull always wins here! The graphics and animations are superb as the RTP of 96.40%. The base game is a little ponderous with lowish pays and only livens up when the Toro appears on reel 5 for the re-spins. The bonus game can be hard to trigger but will usually pay a decent sum if a quite a few Toreadors appear. As far as matador slots go, this one is definitely up there with IGT's Pamplona. So will you show the red rag to this bull?